If you knew my Grampa you would know he didn’t really go anywhere unless he was wearing a 3-piece suit. For 93 years he did this. This proves that the blazer itself has been around for years and years and is such an iconic staple for a man or woman to add to their wardrobe. Okay fine if you don’t believe my Grampa you should believe Coco Chanel, because she always had on these blazers to die for. So I am going to wishfully assume you all own a tailored perfectly fitting black blazer, one that you would die for. If you wouldn’t die for your blazer then divorce it, stat. If you don’t own one, then I’m disowning you. k bye. Or just go buy one and we can be friends again (I’m sucha pushover). Did ya notice my pics look more professional this week? 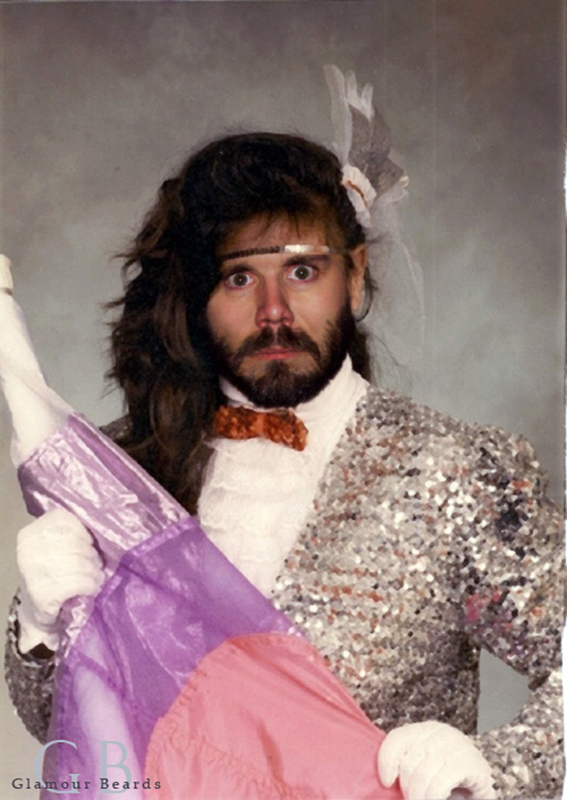 YUP, I’m rich and famous now and eat only caviar and take champagne showers. Or my Dad is a photographer and took them for free. I mean which sounds more realistic? You decide. I’ll just keep poppin bottles. First things first. 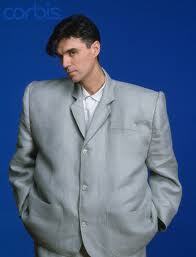 Wearing a blazer can go terribly terribly wrong. There are really only two rules to follow, seems simple, but somehow people turn simple into scary. Rule #1: Your blazer should be structured/fitted/tailored, if you are blowing dust off it from the 80’s or you lost 40 lbs and think it still looks okay, BUY a new one. Or borrow Marty McFly’s time machine because no one will want to be your friend in that in the present (the truth hurts, I keeps it real). Rule #2: You should definitely own a plain black blazer since it’s so versatile, but you can also get fun with different colors, details, or if you’re feeling really crazy different patterns. But please know when too much is….too much. You probably don’t have to wear a blazer everyday to work, ya know unless you have one of those circus jobs like a lion tamer, ring master or lawyer, but they are fun to incorporate here and there to add some variety and so your interview only suit actually gets some wear out of it. I like to mix and match the pants/blazer colors to avoid looking too conservative and matchy matchy. Unless you have an interview or client meeting you are risking looking like Miss Trunchbull from Matilda (see picture below). 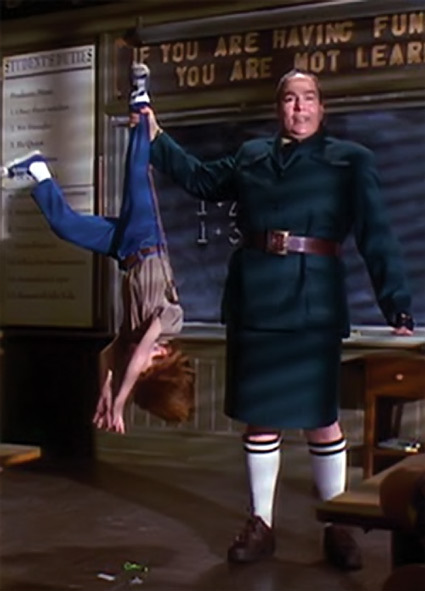 If I see you dressed liked Miss Trunchbull from Matilda I’m going to sit you down and make you eat an entire chocolate cake. You’ve been warned. Black Blazer + Button-down Shirt + Slacks + Heels. Don’t pack away those mini skirts for the winter ladies, you can easily pair them with a blazer and head out on the town lookin H-O-T hot and also feel nice and hot with those long sleevies. Okay, you probably will still be cold, so put on a jacket until you get in the bar dummy, but you will definitely stand out next to all of those girls in black skinny jeans. It’s a good look because the blazer is saying “Hey, I’m a smarty professional pants”, but then the mini skirt says “Hey I’m here to party hardy.” Try not to talk to your clothes too often, or use this as a pick up line, unless you are having a contest with your friends to bring home the creepiest weirdest weirdo in the bar. You should also incorporate pepper spray into your ensemble if you are participating in this contest. Black Blazer + Black Tank Top + Sequin Skirt + Heels. Okay I cared a lot this week, but seriously I can’t wear a blazer with black leggings because I will probably look like a weird penguin. Like, not the cute animal, the guy from Batman. The key to making your blazer more chilled out, maxed, relaxed and cool is to roll up the sleeves. Bonus points if you have a cute lining on the inside. I just have a super soft semi-baggy t-shirt on under there which is always so comfy and sometimes hard to wear anywhere without looking all raggedy ann(“but she wore a jumper not a t-shirt Maureen.” Just SHUTUP you know what I mean). I like to wear this on casual Fridays to work (yup. a don’t care look to work instead of a work look to work, so sue me) so I can come home, take off the blazer and jump right into my “I really don’t care, I’m watching a movie and eating ice cream for dinner” look. Black Blazer + Grey T + Scarf + Suede Flats. Okay to summarize if you don’t own a black blazer go buy one, NOW! These puppies literally never go out of style. 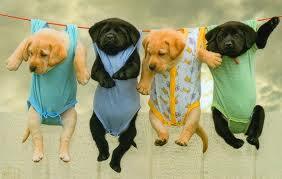 These puppies below also never go out of style AWWWWWWWWWWWWWWWW!! Want to share: I once had a black blazer that I wore to death until it had holes in it, I wore it with jeans, skirts, pants and even with a pair of pajama pants (to this day I can’t believe I walked out of the house with a pair of pajamas on—that was during my Woodstock and Prince stage in my life) Anyway, you are so right you can’t go wrong having a black blazer in your closet. A definite closet essential, thanks for sharing!